← Are you a sharer? I’m feel we ought to discuss this overwhelming infiltration of emoji. These weepy/winking faces, clapping hands and dancing women have taken over our heads, words and minds. Even those with ridiculously high IQ seem to be substituting curious pictures for wordy description and true emotion and, to be honest, I’m wondering if this can end well for our world at large. Emoji first entered our vocabulary in the mid 90s. A Japanese tech developer dreamt up the colourful team way back in that pre-iphone-era. Of course there really wasn’t much demand for the technicolour smiley face cult before we had the tools to litter them. 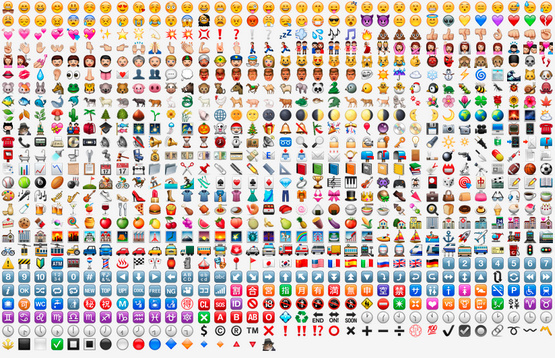 Now billions of emoji are flung through the ether each year and I’d say that we’re now pretty symbol obsessed. On any given night out, Mini (back home) can send me anywhere in the region of 50 little characters (via email) to express her love and longing. I return around 30 of the damn things hoping that this will coax into putting down her screen and placing her head on the pillow. Instagram is infested with the latest craze of these pictograms. Thumbs up for something impressive, fire for this heat wave, ice-cream at the ready and any assortment of multicoloured hearts to tie in with real words, an image or both. So, should I be concerned? Is it not enough that we now dream in photographic squares, communicate in status updates and tweet more than we speak? Instead of finding the words, we seem to reach for the icon. I’m all that smiley faced with tongue hanging out about the emotionless-emoji thing.